In CodePipeline Update – Build Continuous Delivery Workflows for CloudFormation Stacks, Jeff Barr discusses infrastructure as code and how to use AWS CodePipeline for continuous delivery. 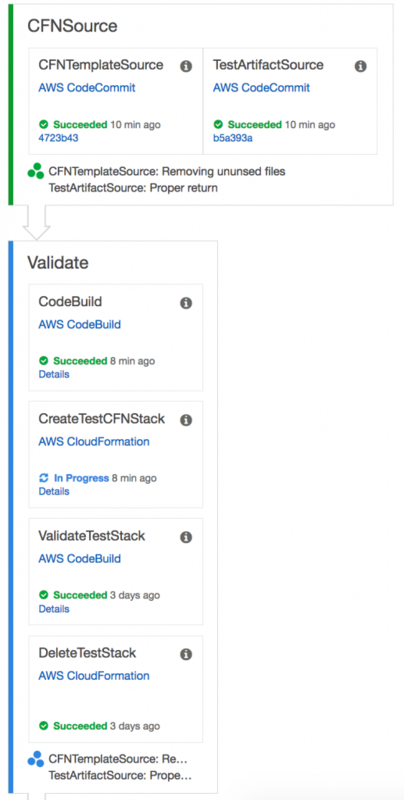 In this blog post, I discuss the continuous delivery of nested CloudFormation stacks using AWS CodePipeline, with AWS CodeCommit as the source repository and AWS CodeBuild as a build and testing tool. I deploy the stacks using CloudFormation change sets following a manual approval process. CloudFormation templates, test scripts, and the build specification are stored in AWS CodeCommit repositories. These files are used in the Source stage of the pipeline in AWS CodePipeline. The AWS::CloudFormation::Stack resource type is used to create child stacks from a master stack. The CloudFormation stack resource requires the templates of the child stacks to be stored in the S3 bucket. The location of the template file is provided as a URL in the properties section of the resource definition. Web stacks (EC2 instances in an Auto Scaling group, elastic load balancer). During the Validate stage, AWS CodeBuild checks for changes to the AWS CodeCommit source repositories. It uses the ValidateTemplate API to validate the CloudFormation template and copies the child templates and configuration files to the appropriate location in the S3 bucket. The following AWS CodeBuild build specification validates the CloudFormation templates listed under the TEMPLATE_FILES environment variable and copies them to the S3 bucket specified in the TEMPLATE_BUCKET environment variable in the AWS CodeBuild project. Optionally, you can use the TEMPLATE_PREFIX environment variable to specify a path inside the bucket. This updates the configuration files to use the location of the child template files. The location of the template files is provided as a parameter to the master stack. After the template files are copied to S3, CloudFormation creates a test stack and triggers AWS CodeBuild as a test action. Then the AWS CodeBuild build specification executes validate-env.py, the Python script used to determine whether resources created using the nested CloudFormation stacks conform to the specifications provided in the CONFIG_FILE. Upon successful completion of the test action, CloudFormation deletes the test stack and proceeds to the UAT stage in the pipeline. 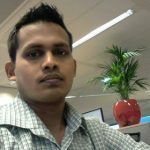 During this stage, CloudFormation creates a change set against the UAT stack and then executes the change set. This updates the UAT environment and makes it available for acceptance testing. The process continues to a manual approval action. After the QA team validates the UAT environment and provides an approval, the process moves to the Production stage in the pipeline. During this stage, CloudFormation creates a change set for the nested production stack and the process continues to a manual approval step. Upon approval (usually by a designated executive), the change set is executed and the production deployment is completed. I used a CloudFormation template to set up my continuous delivery pipeline. The codepipeline-cfn-codebuild.yml template, available from GitHub, sets up a full-featured pipeline. SNS topics to send approval notifications. The CFNTemplateRepoName points to the AWS CodeCommit repository where CloudFormation templates, configuration files, and build specification files are stored. The continuous delivery pipeline is ready just seconds after clicking Create Stack. After it’s created, the pipeline executes each stage. Upon manual approvals for the UAT and Production stages, the pipeline successfully enables continuous delivery. In this post, I showed how you can use AWS CodePipeline, AWS CloudFormation, AWS CodeBuild, and a manual approval process to create a continuous delivery pipeline for both infrastructure as code and application deployment. For more information about AWS CodePipeline, see the AWS CodePipeline documentation. You can get started in just a few clicks. All CloudFormation templates, AWS CodeBuild build specification files, and the Python script that performs the validation are available in codepipeline-nested-cfn GitHub repository.